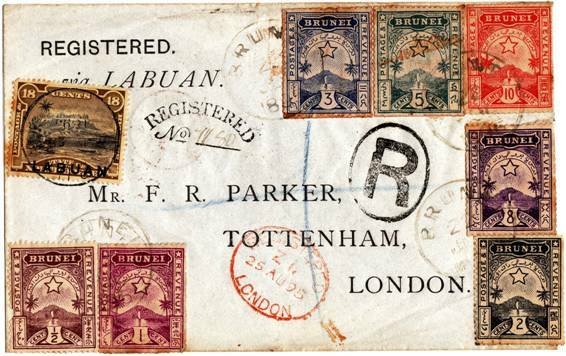 It seems to me to be number 1180 (though it could be 1150), but the Labuan franking only matches 1150. I'd be grateful to see the opinions of others (and thought the scan might be of use to specialists). I can also supply a scan of the back if helpful. 1. Your cover has registration number 1180. I have a cover which, although the top stroke of the manuscript '5' is missing, is numbered 1150. In the 1990s to the early 2000s I corresponded frequently with Brian Cave about these covers. He was developing a census, and published his findings in the Sarawak Journal - see SJ 46.122 and later SJ 51.118. He recorded that the Parker covers had registration numbers from 1092 to 1292. The only imperf I know of are the 10c, which Robson Lowe found sheets of, the 8cent and the 5 cent, these illustrated are clearly the forgeries. 3. I too am convinced that you have no 1180. My own Parker cover is 1186 and the writing is very similar. The clerk or postmaster who entered the numbers by pen had a particular style! His pen made the stroke used for the number 5, presumably a downstroke, very much thicker than the return stroke which would complete the number 8. On my copy the latter stroke is much fainter but nevertheless clear enough on closer inspection. And even then (see the previous comment) his figure 8 had no top to it.